ln SAS Viya, deployments identities are managed by the environments configured identity provider. In Visual SAS Viya deployments the identity provider must be an LDAP (Lightweight Directory Access Protocol) server. Initial setup of a SAS Viya Deployment requires configuration to support reading the identity information (users and groups) from LDAP. SAS Viya 3.3 adds support for multi-tenancy which has implications for the way users and groups must be stored in LDAP. For the SAS Administrator, this means at least a rudimentary understanding of LDAP is required. In this blog post, I will review some key LDAP basics for the SAS Viya administrator. A basic understanding of LDAP ensures SAS Viya administrators can speak the same language as the LDAP administrator. LDAP is a lightweight protocol for accessing directory servers. A directory server is a hierarchical object orientated database. An LDAP server can be used to organize anything. 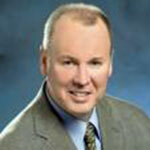 One of the most common uses is as an identity management system, to organize user and group membership. A directory is a tree of directory entries. An entry contains a set of attributes. An attribute has a name, and one or more values. The attribute value pairs are the details of the entry. The objectclass attribute is worth a special mention. Every entry has at least one objectclass attribute and often more than one. The objectclass is used to provide the rules for the object including required and allowed attributes. 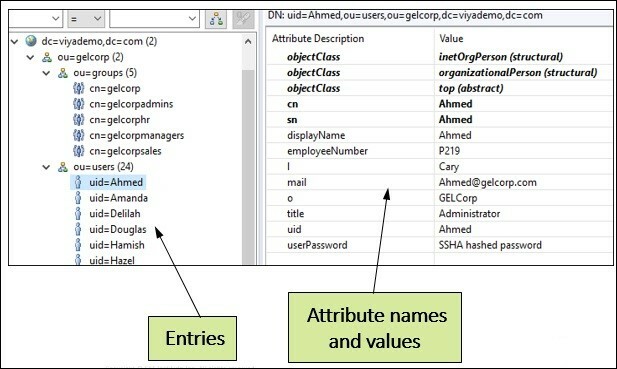 For example, the inetorgperson object class specifies attributes about people who are part of an organization, including items such as uid, name, employeenumber etc. Let’s now look at the organization of the tree. DC is the “domain component.” You will often see examples of LDAP structures that use DNS names for the domain component, such as: dc=sas,dc=com. This is not required, but since DNS itself often implies organizational boundaries, it usually makes sense to use the existing naming structure. In this example the domain component is “dc=geldemo,dc=com”. The next level down is the organizational unit (ou). An organizational unit is a grouping or collection of entries. Organizational units can contain additional organizational units. But how do we find the objects we want in the directory tree? Every entry in a directory has a unique identifier, called the Distinguished Name (DN). The distinguished name is the full path to the object in the directory tree. 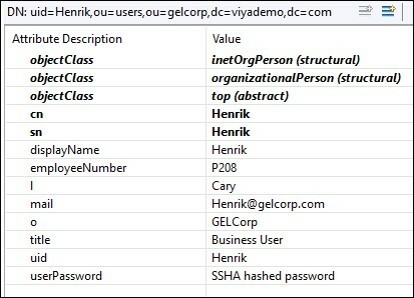 For example, the distinguished name of Henrik is uid=Henrik,ou=users, ou=gelcorp,dc=viyademo,dc=com. The distinguished name is the path to the object from lowest to highest (yes it seems backward to me to). (sn=Jones): return all entries with a surname equal to Jones. (objectclass=inetorgperson) return entries that use the inegorgperson object class. (mail=*): return all entries that have the mail attribute. (&(objectclass=inetorgperson)(o=Orion)): return all entries that use the inetorgperson object class and that have the organization attribute equal to Orion (people in the Orion organization). (&(objectclass=GroupofNames)(|(o=Orion)(o=Executive))) return all entries that use the groupofNames object class and that have the organization attribute equal to Orion OR the organization attribute equal to Executive (groups in the Orion or Executive organizations). BaseDN the entry in the tree from which the LDAP server starts it search. ObjectFilter the filter used to identity and limit the users and groups returned. There is a separate BaseDN and ObjectFilter for users and for groups. This would tell SASVIYA to begin its search for users and groups at those locations in the tree. There are a lot of LDAP clients available that will allow you to connect to an LDAP server and view, query, edit and update LDAP trees and their entries. In addition, the ldif file format is a text file format that includes data and commands that provide a simple way to communicate with a directory so as to read, write, rename, and delete entries. This has been a high-level overview of LDAP. Here are some additional sources of information that may help. Very useful Gerry! Can you please give an example of specifying an LDAP filters for allowing only 3 specific users? Glad you found it useful. The following filter uses the or (|) operator to restrict the users returned to only the three uid's.